Chipotle Stock Dips After Some Va. Customers Report Illness : The Two-Way Chipotle temporarily closed a Sterling, Va., restaurant to sanitize it. A company representative told NPR that the reported symptoms were consistent with norovirus. 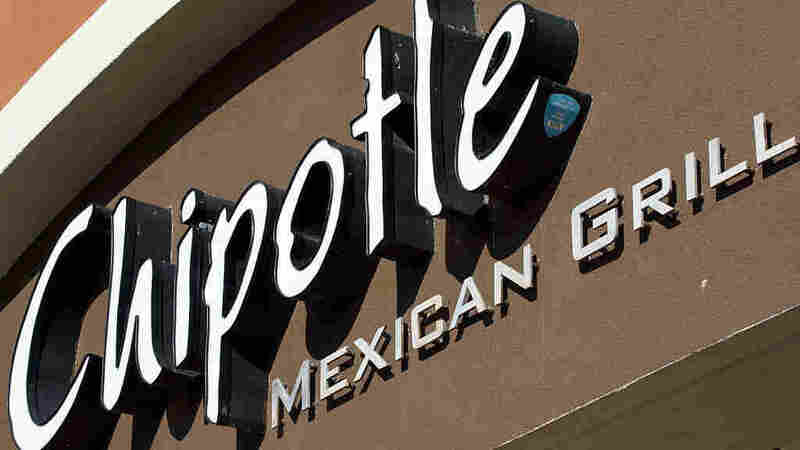 A Chipotle restaurant in Sterling, Va., was temporarily closed. This sign is from a location in Fairfax, Va.
Chipotle saw its stock dip Tuesday after it temporarily closed a Sterling, Va., restaurant where several people reported getting sick. "That is an especially sensitive issue for Chipotle, which struggled with recurring problems with foodborne illness two years ago that caused its stock price to plummet," NPR's Yuki Noguchi told our Newscast unit. "Investors showed signs of nervousness again today, with the stock losing, at one point, more than 7.5 percent in value." Chipotle's stock was trading at nearly $750 before its food safety incidents began, according to Reuters. Tuesday, it closed trading at just under $375. Jim Marsden, the company's executive director of food safety, told Yuki that the company closed the restaurant Monday "to conduct a complete sanitization." He said that the company is working with health officials to determine the cause of the illnesses. "The reported symptoms are consistent with norovirus. Norovirus does not come from our food supply, and it is safe to eat at Chipotle," Marsden added. According to the Centers for Disease Control and Prevention, "infected food workers are frequently the source of [restaurant] outbreaks [of norovirus], often by touching ready-to-eat foods, such as raw fruits and vegetables, with their bare hands before serving them." During its series of food safety issues two years ago, Chipotle was also linked to several other types of outbreaks at multiple locations across the country, including E. coli and salmonella. Boston health officials also said that norovirus was the cause of an outbreak in 2015 that sickened more than 120 Boston College students, as member station WBUR reported. That same year it hit an even larger group of people — at least 189 — at a restaurant in Simi Valley, Calif. The company implemented new food safety procedures and said in January 2016 that they were "largely in place." It plans to announce its second-quarter results next Tuesday. A previous caption incorrectly referred to Sterling, Va., as Starling.